Receive email and/or text alerts for specific 24hr forecast variables like temperature, wind chill, heat index, wind speed, and more reach your desired range. When a general weather forecast isn’t enough and specific forecast details matter! For complete service detail click Impact Based Weather Forecast Alert Monitoring. 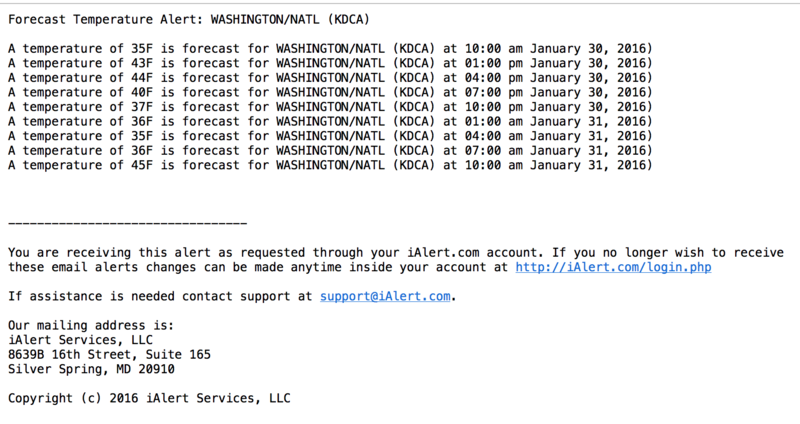 Sign-up today for Impact Based Weather Forecast Alerts, click here. This entry was posted in iAlert Functionality and tagged daily weather forecast, email forecasts, email weather forecasts, forecast examples, text forecasts, text weather forecasts, weather forecast, weather forecast alerts, weather forecast by email, weather forecast by text message, weather forecast sample formats. Bookmark the permalink.